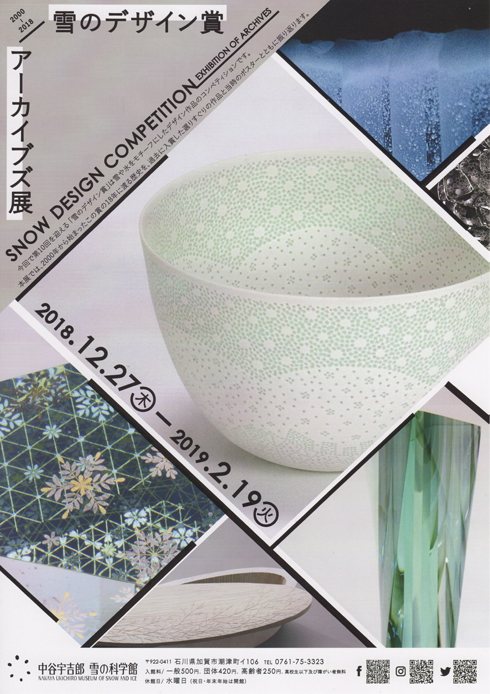 The museum exhibition,“Snow Design Competition Exhibition of Archives” will be held at Nakaya Ukichiro Museum of Snow and Ice. The following work by Akane Yamamoto will be on exhibit. 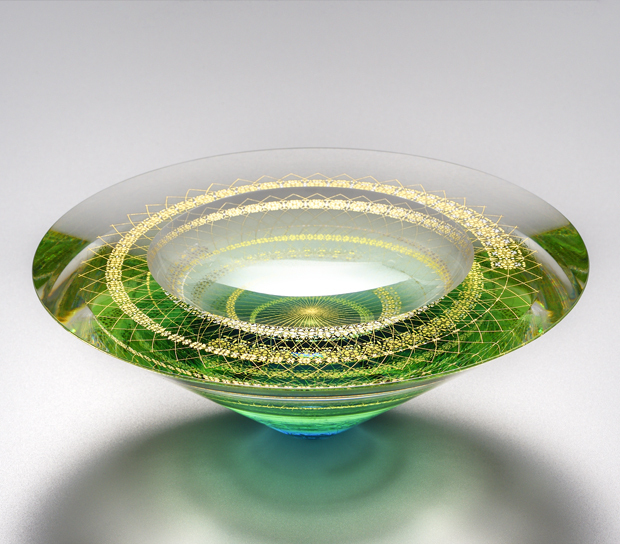 Akane Yamamoto's Kirikane Glass flower vase “Mizukagami (Water Reflection)” has been selected as part of the exhibition. Please visit the exhibition webpage to learn more about dates and venues. Peering into the water, we see our reflection on the surface – but as the wind blows, or raindrops fall, and the fish leap, the image is swept away by the ripples. When the surface returns to its peaceful state, the reflection has changed. Even this very moment becomes the past with the blink of an eye, and things continue to change; but this is also why the present moment shines through. The foot of the vase is carved to a wide angle, which allows the whole structure to gather and radiate light. The depression on the top not only functions as a basin for water, but also has the effect of making the glass vanish, drawing the beholder’s eye deeper into the piece. Looking at the piece from the bottom, one will see the Kirikane designs reflected in the depression with beautiful complexity. I hope that viewers will observe and enjoy the piece from many angles. An article I wrote about my work for the “Sophia Kyoto Shimbun Cultural Congress” series was featured in the June 29th morning paper. Please enjoy a translation of the article below. I am the world’s only Kirikane Glass artist. As the name suggests, Kirikane Glass put simply is a way of trapping Kirikane within a three-dimensional glass form, which–much like a kaleidoscope–allows the Kirikane countless different expressions due to the optical effects of the reflections and refractions. 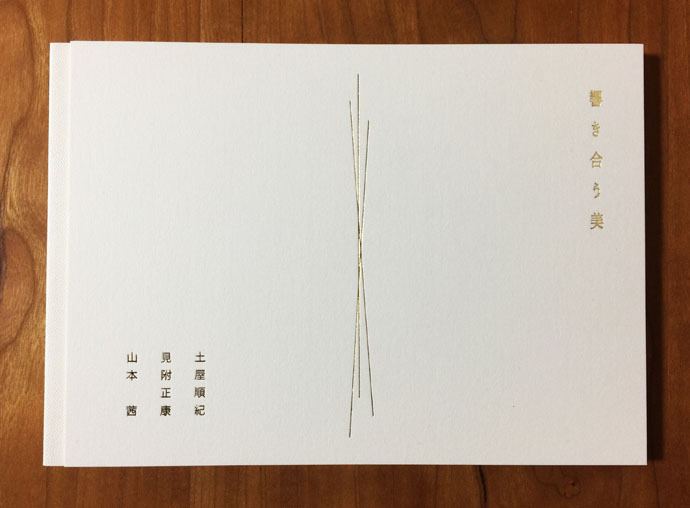 Kirikane is an ancient method of creating extremely delicate patterns by adhering fine strips of gold foil to a surface, used mainly to decorate Buddhist sculptures and paintings. It was brought into Japan along with Buddhism during the 6th century, and was well received among the aristocrats of the capital in Kyoto during the Heian Period. Kirikane was at its peak during this period and the technique has been passed down to today, mainly in Kyoto. Some readers might have seen Kirikane at temples or museums, as it was applied quite frequently to the fine Buddhist statues and paintings of the Heian period. After having long aspired to make Kirikane stand on its own as a work of art instead of limiting it to a mere decorative element, I decided to try suspending it within a three-dimensional space by trapping it inside a clear glass structure–and this was how Kirikane Glass came to be. I have been grappling with both Kirikane and glass ever since. My work is inspired by the nature of the four seasons and by works of literature, but in particular, I consider it my life’s mission to create a body of work based on the 54 chapters of The Tale of Genji. I am in the process of creating a three-dimensional abstract piece based on the most memorable scenes in each of the chapters, and dream of having a museum exhibition when the series is complete. I have finished 20 pieces so far; 34 pieces remain. It is a long way to go. I will refrain from giving a full explanation of why The Tale of Genji is so significant, as that would go well beyond these pages–but in short, it has been my favorite book since my middle school days. Even the very reason I entered Kyoto City University of Arts was because I dreamed of creating an emaki picture scroll with beautiful paintings like those by the master artist Shōen Uemura. My direction shifted when I discovered the beauty of Kirikane during my University years, but the core of what I want to express has remained the same. On top of that, Kirikane is an art form that was at its height during the Heian period–the very era during which The Tale of Genji was born–and is thus the perfect technique for this body of work because it embodies the elegance of that time. Part of the process in creating these pieces is to let my imagination flow by visiting the actual places that appear in the story. Wandering around the city of Kyoto, I discovered an area called “Yūgaochō(Yūgao*-neighborhood)”, and many other things that cause me the illusion that perhaps The Tale of Genji is not fiction, but true history. The world of The Tale of Genji is very much alive in Kyoto, even today. I live in the mountainous regions so I am also able to experience nature just as it is depicted in the story; the misty mountains, the fireflies flitting about, or the cry of the deer, all become a source for the images I create. Working on Kirikane in my studio, sometimes I find myself experiencing the strange sensation that the ends of the gold lines somehow connect to the Heian period. I carry the technique and spirit of that era forward and strive to bring The Tale of Genji to life through my work, reinventing Kirikane as a three-dimensional expression within the glass. * “Yūgao”: the title of one of the 54 chapters, and the nickname of one of the lovers of the Tale’s protagonist, Hikaru Genji. Adrian Sassoon, a London based gallery, will be showing one piece of my work at their stand B27 during MASTERPIECE 2018 London. 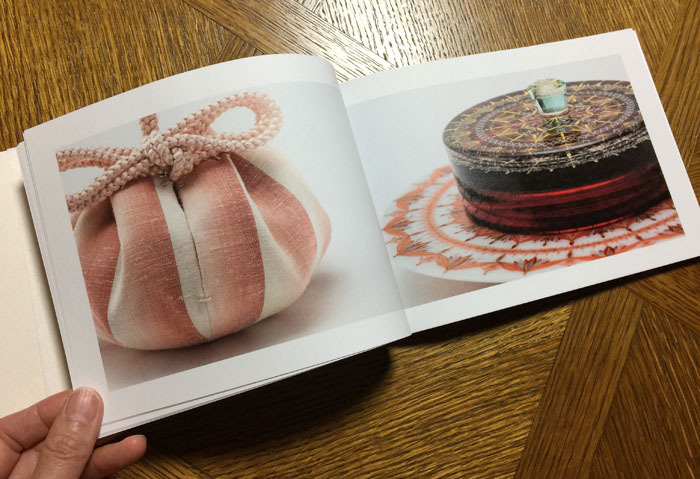 Release of the catalogue of the exhibition entitled Hibikiau Bi (Resonating Beauty). The catalogue of the three-men exhibition, in which I was one of the participants, entitled Hibikiau Bi (Resonating Beauty) held in autumn 2017 has just been released. The catalogue contains the photographic representation of all of my exhibits included in the show. It is on sale at Gallery Now. Please contact them directly should you need more information.